Do you want to reduce sickness to colds and flu by boosting your immunity and improving your DNA repair rate? Do you want to reduce allergies? Radiant beads are simply a set of traditional Czech glass beads designed to give off a healthy level of radiation based on ancient healing principles that have been in use for some 3000-5000 years or more in Europe, Russia and Asia and Japan. They are beautiful and rich in colour and glow under UV light. Because of this they were popular in the 1960s and 1970s to wear for dancing under the (UV) black lights that were popular back then in dancing establishments. They are made with 2% natural uranium dissolved into the glass and were first manufactured in about 1840. Exposure to natural source ionizing radiation has been proven to reduce cancers by 30%. See research by Dr. T. Don Luckey. The natural radiation improves immunity, arthritis and has a balancing effect on the immune system that sometimes stops allergies. In the 5 areas of the world (in India, Iran and South America) with high natural radiation that is 100 to 200 times above normal they experience 30% fewer cancers and 20% fewer congenital birth defects. In addition they experience less colds, flu and other infectious diseases. 100 years of research clearly shows advantages to receiving low dose supplementary radiation. Radiant Beads heal through low dose radiation hormesis. Also the site http://radiation-hormesis.com gives a library of science research papers. When I was young I crushed my ankle in a work related accident. I’m 43 now and I have regular issues with pain and stiffness; now more than ever. Recently during a particularly bad period where I had acute and nearly debilitating pain I tried using some radiant beads in the form of an anklet. Within 24 hours there was significant improvement and within two days I was back to my regular self. Coincidence? Placebo? Maybe. All I know is I’m going to try it again next time! Since wearing 5 radiant glass beads I never get sick with a cold for more than a few hours. The worst cold I have had in the last year has only lasted for 1/2 day. From wearing a set of radiant glass beads my chronic (allergy triggered) asthma has lightened up. I have not had difficulty breathing for some months. A serious neck injury that causes continuous pain is greatly relieved by wearing radiant glass beads. In this case I am wearing a full set of beads that go completely around my neck. I tried just a few beads but ended up having to purchase a full length necklace of uranium glass beads before it stopped the neck pain. After hearing about uranium glass beads for ankle pain relief I made a set of 10 U beads into a bracelet to treat an old wrist and forearm injury caused by typing. Over a period of 1 month the pain was greatly reduced and as I continued to wear the beads for a month more I could resume typing without pain. When I quit wearing the bracelet the pain returns. I have been wearing the beads for years and observed that I get much fewer colds and flu incidents. Typically people find that they receive pain relief and an improvement of immunity. The pain relief does not imply that the underlying problem has been solved. In the case of improved immunity it would appear that diseases such as flu and colds can be prevented. 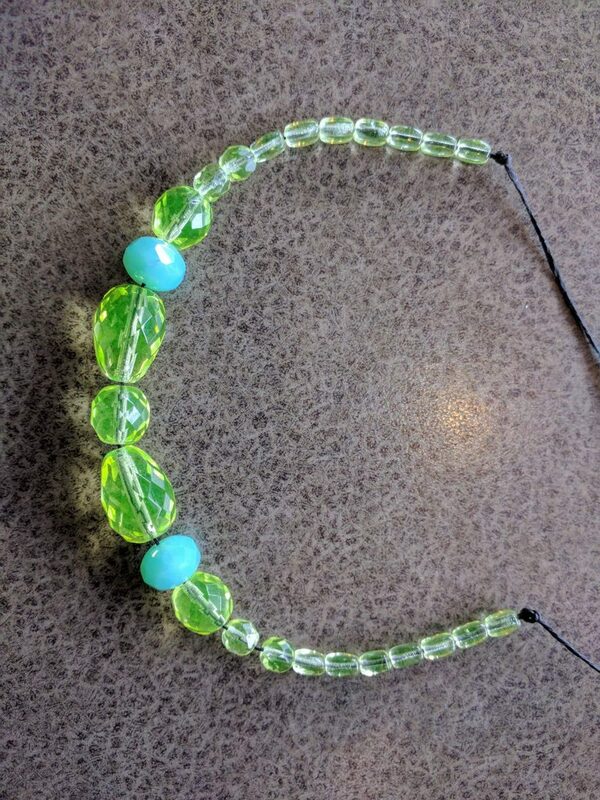 Some have tried using uranium glass beads to cure an existing cold but this has been unsuccessful. It would seem that the immunity boost from the beads takes a few days to a week before it works. 3 micro-sievert/hour radiance the price is $40 (US) plus $8 shipping. All necklaces are similar to the one shown below but they may have up to 10 smaller beads and be of different shapes / colours. The beads are rare and not always the same colour and shape. We measure and calibrate them so that each necklace is 3 micro-sievert/hour. This results in yearly exposures (if worn constantly) of 26 milli-sievert/year. This can be seen to be very beneficial if you view the science data in the Menu above or at the site … http://radiation-hormesis.com. A magnetic clasp is used for all necklaces. Radiation Hormesis Scientific Site: Cancer prevention benefits of low level nuclear radiation. Mind Body Harmonizer: Gentle Brain Stimulation.